When cooking with fruit and vegetables, I work with kid gloves so to speak. It's a great task, to take these gifts of the earth, alive with their own spirit, and create desserts with them. One must take into consideration who these fruits are, what their inherent qualities are, and how to best manipulate them into a dessert while preserving their personalities. I like to let things be what they are, manipulating them very little, and pairing them with complimentary items rather than changing them into something else. My last recipe for rhubarb did just that. By steeping thin shavings of the crisp, tart vegetable in a simple syrup, every quality of the fibrous stalk was preserved. Rhubarb in the buff you could say. 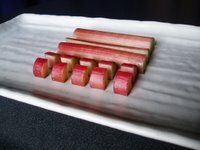 The recipe results in a sweet-tart dessert component with a crisp texture, exemplifying what Rhubarb is at it's core. This said, I am sharing with you today a recipe that contradicts this statement. I am taking rhubarb, exposing it to heat, and breaking the fibrous bonds that hold this bright stalk together. It's not that I am changing who rhubarb is. I am releasing a hidden part of it's personality. Within those thin fibrous strands, strong enough to hold the stalk high and support umbrella like leaves, is a luscious, thick compote waiting to be liberated. With the coaxing of a mild heat, we are introduced to the softer side of rhubarb. While the original stalk may no longer be recognizable, this compote is rhubarb, through and through. This recipe sets the amazing flavor of rhubarb on a pedestal, elevating it with a complimentary dose of orange liquor, heightening it with the sweetness of the sugar. Because heat is used to break the structure down, there is no need to peel the fibrous skin away. Thus, the red skin imparts a beautiful rosy hue to the compote. I am serving the compote simply, aside a stack of very rich Breton Shortbread and a billowy cloud of caramelized cinnamon cream. The possibilities are truly endless with this beautiful compote. I day dream about serving it with buttermilk biscuits and vanilla ice cream for an early season twist on strawberry shortcake. I see it chilled inside tart shells, served warm over a simple bowl of ice cream, or layered between crepes. Sometimes, I might even just eat it with a spoon. 2. In a large bowl, toss the rhubarb with the sugar and set aside. 3. Melt the butter in a medium heavy bottomed saucepan over medium heat. When the butter has melted add the sugar coated rhubarb and the orange liquor. Let this cook over a medium heat, undisturbed, for about 2 minutes. When the rhubarb has started to release juices, gently stir. * I set a timer last time I made it, just for you, and it took 13 minutes and 17 seconds until the desired texture and thickness was reached. 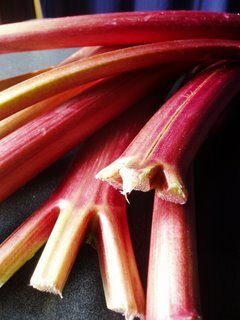 This time will depend on the size of your rhubarb pieces, the particular heat of "medium" on your stove, etc, etc, etc. So use your intuition. * Many of the cubes will break down from cooking, but some of the larger ones will remain as little tender lumps, offering bursts of tart rhubarb flavor in the mouth, and a pleasant texture on the tongue. If you like, you can break all the rhubarb apart with aggressive stirring, using the spoon to break the rhubarb up. 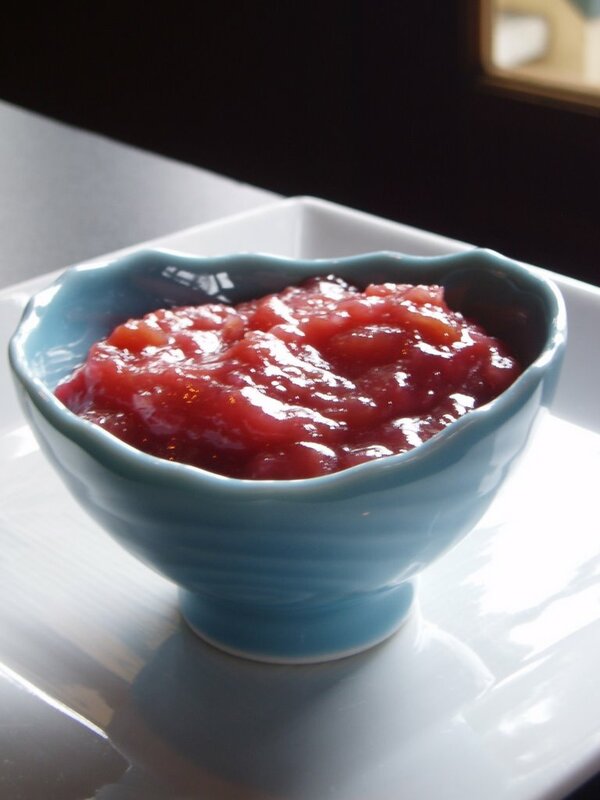 You might even puree it and pass it through a sieve if you are looking for a smooth compote. But the less you stir, the more chunks you will leave intact. Ever tried swapping a few rose petals for the orange?. Great this time of year with some really fragrant red tea roses, you could play around with some rose water too or even add some pectin for a rhubarb/rose jelly. I haven't tried the roses yet, but was reading that they are wonderful together. I have a bottle of rose water and just may take your suggestion tomorow! Matthew made the compote to serve warm over vanilla ice cream this evening, and we all loved it. Iris finished her dish, then seized the serving spoon to deliver rhubarb directly to her mouth. Breakfast will definitely involve chilled compote stirred into Greek yogurt. Thank you! I recently bumped into your blog and it is fantastic. Love rhubarb. I've added you to my blog roll. I came across this recipe from the UK Observer's Nigel Slater and thought of you. With your delicious compote, the addition of "snow" would be interesting - non? Set the oven at 200C/gas mark 6. Rinse the rhubarb under running water, cut off the tough bits, pulling away any strings as you go, then cut into fat chunks. Put the rhubarb and tablespoon of caster sugar into a stainless steel or ovenproof glass dish and bake for 30-40 minutes until completely tender. (Alternatively you can put it over a low heat in a heavy saucepan, with a tablespoon of water and let it simmer gently.) Remove from the oven once it is truly soft and silky, and leave to cool. Miss Bizwaps- Thanks for writing an entire recipe just for me! It looks very good. I am already thinking of how to incorporate a little rose water into the whites, a delicate flavor to match an obviously delicate dessert. And a flavor combo that is so very british! this sounds delicious! i often make rhubarb compote, adding in strawberries if i have a few, or some grated orange peel if there's an orange lying around. we put it in yogurt. i also can it, so we can enjoy it in our yogurt all year! i made some pearl barley for another recipe, and our daughter heated it up and added a bunch of rhubarb compote. she had thirds. LOVE IT! you write so compellingly - thanks for sharing this! I found a link to your blog on Tea & Cookies... Your rhubarb photographs are beautiful! I'm making rhubarb compote again tonight. I adore it! This evening I will be serving it on Orangette's "Everyday Cake" with a little jersey ricotta from Valley Ford, CA topping it all off. I can't wait for that first bite! Just made this with lemon juice (didn't have orange liquor), love it! Wondering if I could make applesauce bread substituting the compote. thanks for the compote recipe.